Memorial to Samuel Wallis and the crew in Truro Cathedral, Cornwall. 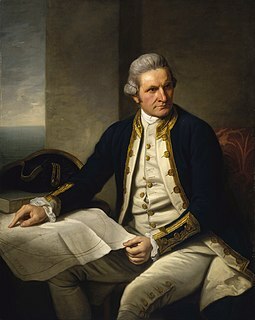 Samuel Wallis (23 April 1728 – 21 January 1795 in London) was a British naval officer and explorer of the Pacific Ocean. He made the first recorded visit by a European navigator to Tahiti. Wallis was born at Fenteroon Farm, near Camelford, Cornwall. He served under John Byron, and in 1766 was promoted to captain and was given the command of HMS Dolphin as part of an expedition led by Philip Carteret on HMS Swallow with an assignment to circumnavigate the globe. 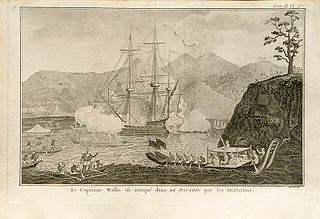 The two ships were parted by a storm shortly after sailing through the Strait of Magellan, Wallis then discovering Tahiti, which he named "King George the Third's Island" in honour of the King (June 1767). 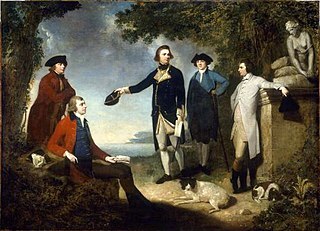 Wallis himself was ill and remained in his cabin: lieutenant Tobias Furneaux was the first to set foot, hoisting a pennant and turning a turf, taking possession in the name of His Majesty. Dolphin stayed in Matavai Bay in Tahiti for over a month. Wallis went on to name or rename five more islands in the Society Islands and six atolls in the Tuamotu Islands, as well as confirming the locations of Rongerik and Rongelap in the Marshall Islands. He renamed the Polynesian island of Uvea as Wallis after himself, before reaching Tinian in the Mariana Islands. He continued to Batavia, where many of the crew died from dysentery, then via the Cape of Good Hope to England, arriving in May 1768. He was able to pass on useful information to James Cook who was due to depart shortly for the Pacific, and some of the crew from the Dolphin sailed with Cook. In 1780 Wallis was appointed Commissioner of the Admiralty. Wikimedia Commons has media related to Samuel Wallis.